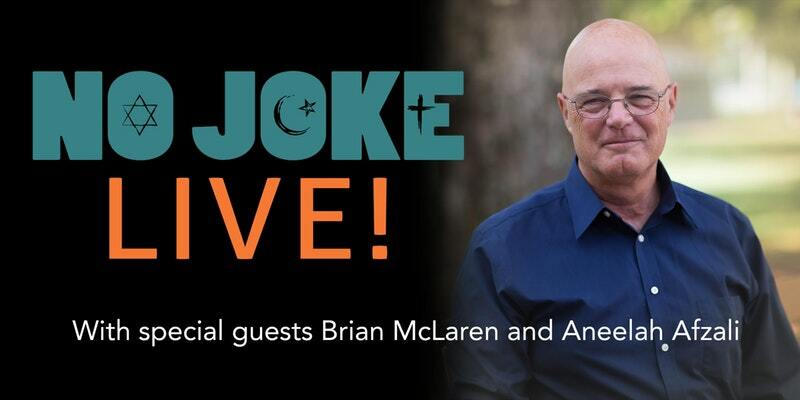 Crossing the Difference Divide with No Joke Live and Brian McLaren is a dynamic opportunity to learn more about developing interfaith relationships. Aneelah Afzali of the Muslim Association of Puget Sound (MAPS), and noted Christian author and public theologian Brian McLaren will join the Christian Pastor, Jewish Rabbi and Muslim Imam whose story is presented in the documentary entitled No Joke: When People Like Each Other the Rules Change. Tickets for the event are $32. A student rate of $15 is also available. Space will be limited, so be sure to buy your tickets quickly. This event is open to the public and is co-sponsored by the Pacific Northwest Conference of The United Methodist Church and Jim Henderson Productions. No Joke Live – Jim Powell, Kamil Mufti, Daniel Bogard, respectively, are the Evangelical preacher, Muslim Imam and Jewish Rabbi from the conservative Heartland of America who share the story of their unthinkable friendship and introduce you to the Three Practices that enabled them to cross the difference divide and connect with each other. You can learn more about them and view the trailer for their film on the No Joke Project website. Aneelah Afzali is the Executive Director of the American Muslim Empowerment Network (AMEN), a new initiative of the Muslim Association of Puget Sound (MAPS) in response to the challenges of our times including the rising threat of Islamophobia. She also serves as a Governing Board Member of the Faith Action Network, and Director of Legal Clinic at the Muslim Community Resource Center. Producer Jim Henderson – acclaimed by USA Today for having “blazed a new path as an innovator, author, church evaluator, self-professed subversive, and leader in the creation of new ways to be publicly and persuasively Christian in the twenty-first century.” He holds a Doctorate in transformational leadership and has been featured in the Wall Street Journal, USA Today, Fox News, and “This American Life” with Ira Glass.